3D-Screens with moving images without having to use 3D glasses – More Media offers one of the most exciting and innovative media of the world. Digital 3D-Screens are the first medium that shows 3D moving images on Ultra HD 4K displays without the need of glasses. 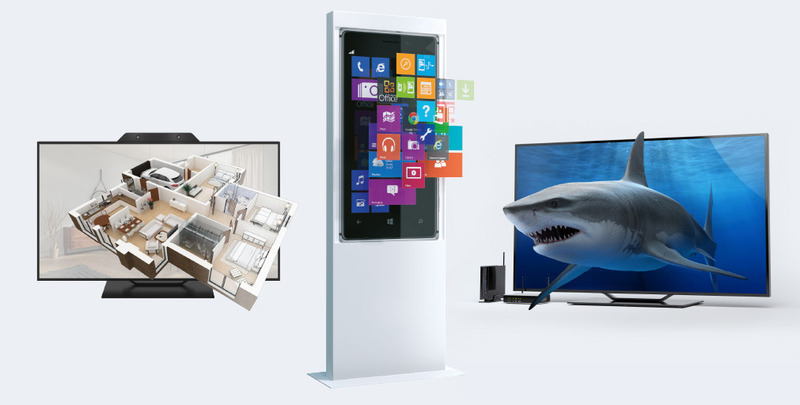 3D-Screens are the innovative alternative to traditional digital signage screens. On our displays objects acts like flying in the air. It seems that they can fly on to the stunned viewer. 3D without glasses stands for a viewing experience with high retention time: Most observers are so surprised of the incredible effect that they employ on average more than 40 seconds with the medium and the content. The display deliver outstanding values in brightness and color accuracy and convince by their brilliant performance. Further benefits: 3D spots can be viewed simultaneously by any number of people without 3D glasses. The use of the screen is always independent of lighting conditions and they can be used at any time of day. Optionally, an operator with a touchpad or an infra-red frame is possible. So viewers can select the shown content by themself. In addition we are offering you the development of your 3D content. Of course it is also possible to change your content on the system at any time. Our glasses-free advertising and infotainment systems that we offer are available in sizes 27 up to 85 inches. The smaller sizes are particularly suitable for storefronts or smaller shops. In addition to the Landscape format we have also a 85-inch portrait format in our portfolio that we use exclusively in our advertising network as a striking campaign medium. We are one of the world’s first provider of this medium. Each 3D system is delivered fully configured (Plug-n-Play) and only requires a power supply.